Aren't you lucky...two logs in 2 days! My last log didn't get sent to due to an error which I was just able to see and correct. As a result you get a double dose of our logs. However, if you "friend" my Facebook page, you were getting almost daily updates as we moved along. I even figured out how to send photos via high frequency (marine ham) radio, which is really cool. The images aren't very high resolution as it take a long time to send them, but it gives you a better idea of where we are seeing on a given day. When you last heard from us we were in Concepcion bay and were headed towards an area known as San Juanico. 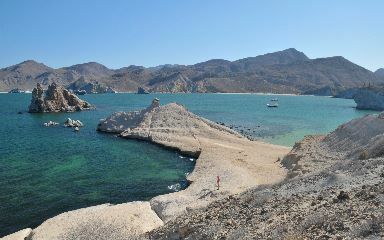 Our first stop was named Punta Pulpito, which is a 475' high headland with a huge vein of obsidian coming out of it. 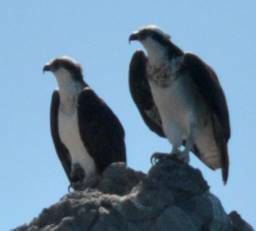 Pulpito means "octopus" in Spanish and while we didn't see any, we did see a lot of Osprey hovering in the thermals around the point. We also got to take our dinghy through some sea caves, which was really cool. From there we moved BlueJacket a whole 8 miles down to Caleta San Juanico, which is beautiful due to the unusual rock formations. There are narrow fingers of rock which stick out into the water and rise up well over 100'. We anchored behind one that had 4 Osprey nests on it and it was great waking up to the cries of the chicks looking for food. Several houses up on a hill had spectacular views of the bay and I climbed up there to get some good photos. While the view is great, I don't know what else you'd do there. From there we made a 28 mile jump to Puerto Ballandra in Isla Carmen. It's been incredibly calm lately and we've often been motoring along on almost glassy seas. Not that it mattered due to the light winds, but Puerto Ballandra is provides wonderful protection from all directions except W due to the high hills that surround the anchorage. I decided to climb one of these hills and found it very challenging due to loose gravel-size to foot-sized pieces of rock that made up the "trail". 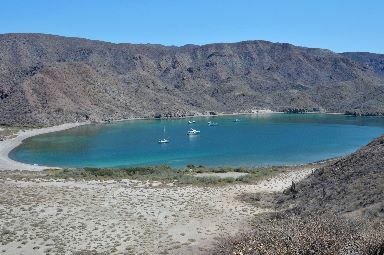 While it provided a great view of the anchorage and Loreto across the water, it was not a climb for those unsure of their footing. While we were in the area, we got to know Orin and Sherry Riddell on M/V Orion. They're a great couple from the San Diego area and as luck had it, they had friends flying down to Puerto Escondido on April 3rd. They contacted their friends and they agreed to pick up a new depth sounder to replace the 2 units that had recently failed. We had tried to get one locally, but that failed, so this was a god send. Phew, as it was getting tiring pulling into anchorages with Sue standing on the swim platform with a handheld depth sounder in her hand giving me depth reports. Last Sunday we pulled into Puerto Escondido just before high winds were supposed to sweep through the area. Puerto Escondido is a large bay with over 100 moorings and plenty of room to anchor boats too. What's strange is that they charge you the same to anchor a boat as they do to take a mooring. The reality of why people anchor instead of taking a mooring was reinforced yesterday when someone from the marina came out and told me that I needed to move the boat because the mooring that we were on was out of service. Of course, this was after 2 days and it blew like crazy one day. Puerto Escondido has to be one of the most stunning locations that we've been in. 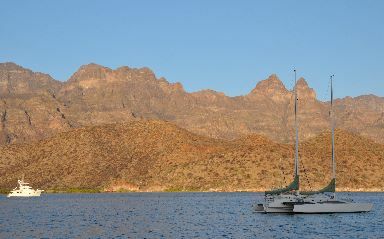 On the west side there is a mountain range named "La Giganta" which towers over the anchorage. When the sun first rises the mountain range just glows with beautiful tints of yellow and orange. The rest of the well protected bay is surrounded by tall hills with breaks in them which allow ventilating wind in and which are called "The Windows." The biggest drawback is that there's nothing around here and the closest town, Loreto, is 35 KM away. Orin & Sherry had rented a car so that they could pick up their friends and invited us to go into Loreto with them. We had been there before, so we provided a bit of the lay of the land. 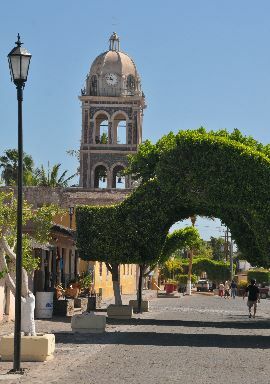 Loreto is a very quaint town with a nice downtown complete with a mission that was constructed in the 1700s as well as beautiful sculpted trees which arch over a central walkway. Once again these towns are struggling with the lack of tourists caused by the US media over-blowing the security situation down her. We haven't found a single cruiser who has ever felt threatened in any way. Quiet honestly, the place that I felt least safe in all of our cruising was when we were docked in downtown Detroit and I wouldn't leave the marina at night. The depth sounder arrived last night and my preliminary tests gave us depth data. I'll substitute it today for the failed unit and then we plan to move south from here.